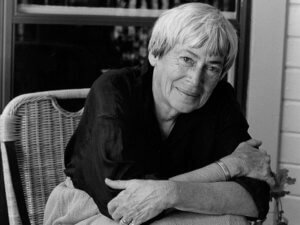 The news of Oregon writer Ursula K. Le Guin’s passing traveled swiftly through our office today. A few moments earlier, a crow had roosted on our fire escape, with yearning eyes and an unusually friendly stance that caught our attention. Two separate instances but in a strange way connected. You see, Ursula’s name is familiar to all of us here at the office. Regardless of our backgrounds and our work to protect Oregon’s treasured water, air and land. As an internationally acclaimed writer who wasn’t afraid to tackle important issues such as climate change, her writing sparked ecological awareness in a powerful way. 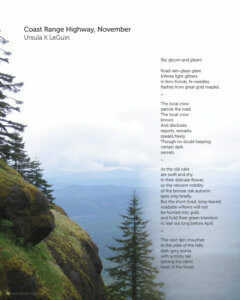 And as this poem shows, simple places such as a coast range highway can represent so much more. The poem is a special piece that stands quietly amidst our daily work to protect Oregon’s water, air and land. A creative connector into the why we do what we do. flashes from great gold maples. to leaf out long before April. Knowing that our work was backed by a passionate Oregon creative force who wasn’t afraid to speak up about important issues, is inspiring. Thank you, Ursula. Rest well. No Replies to "A creative force for our planet: Ursula K Le Guin"